Cupcakes 'n Daisies: Blooming . . . .
25 flower blocks, all done, that's all I need for Carolina. 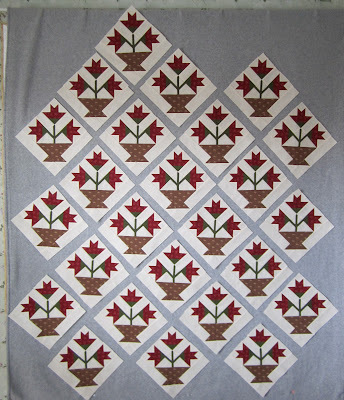 Sometimes, on past patterns where the entire quilt was made up of one block, I would get bored with the piecing. I enjoyed making each one of these blocks, even though they were identical. Maybe because they were the only thing blooming around here. I'm still not missing those handles on the sides of the baskets. Now it's on to the sashing. After looking at these flower blocks for weeks, I have to admit I'm not so sure about that checkered sashing. But I like to think I learn from past mistakes, and remember how I didn't like the looks of the sashing on 3 Barns, and sewed all the blocks together without it, then un-sewed the blocks and added the sashing! I like the looks of the blocks with the sashing on the Carolina pattern cover so it's full steam ahead on making the sashing and using it. How was your Mothers Day? Mine was very nice, although this year, for the fist time in ages, I wasn't with my daughter on Mothers Day. 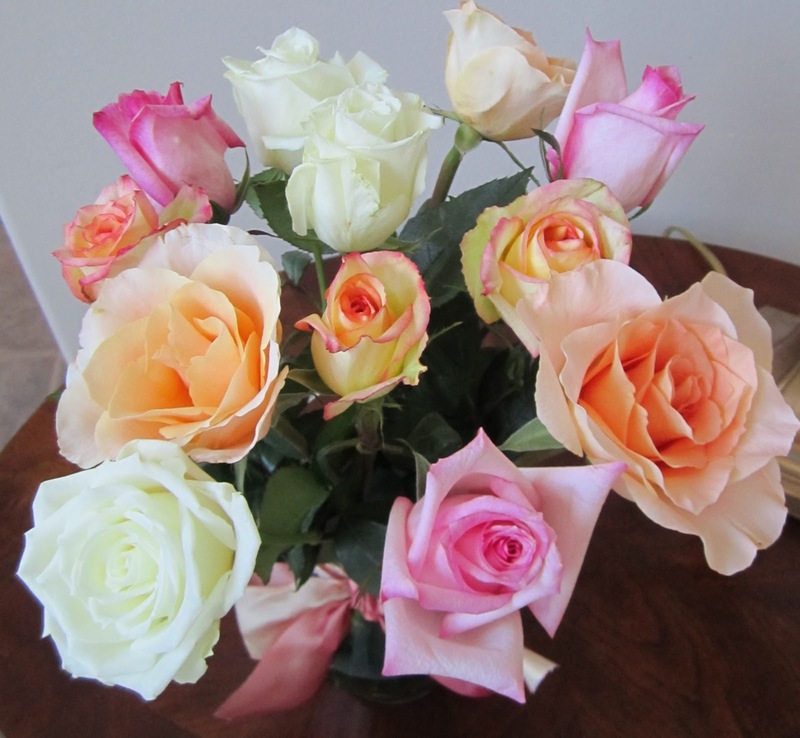 But she did send me these beautiful roses. You may not remember, but a few months ago for a giveaway, I asked folks to leave a comment telling me about their favorite red thing. Someone mentioned how they got their day off to a happy start by making breakfast using their red toaster. It had never even occurred to me to have a red toaster. I gave no thought to my old stainless steel toaster, I used it then put it away, but I liked the idea of a red toaster, and now I have one. This is my kitchen, I don't like things out on the counter, I prefer to store items, like my can opener, mixer, and paper towels in the cabinets. I use them then put them up. I only have the necessities out on my counter, the banana basket, we always have bananas, the coffee maker, the canisters that hold the coffee, and now my red toaster. It's just too darn cute to put in the cabinet. I'm not wantint to jinx myself, but right now I have a pretty free week ahead of me, I'm hoping for a very productive week in my sewing room, it's been ages since I've spent some real time up there, I've just been squeezing in a hour every now and then for weeks, I'm ready to finish up Carolina and move on to something new. On a very sad note, Paula Barnes, the designer of my Carolina pattern and half of the team for Bonnie Blue/Red Crinoline Quilts lost her husband unexpectedly this month. I took a class with Paula at the the Buggy Barn last fall, she shared some wonderfully funny stories about her family and her husband. That family has been in my thoughts this week as I work on Paula's pattern, will you send some kind thoughts their way this week as well? I'm sure the family would appreciate it. I was given a red toaster, and I was thrilled! Mine is all red; looks good with my red Keurig and my red teapot with the white polka dots. Just a little splash of color in my kitchen, and that's all I need. the blocks look great, can't wait to see it with the sashing...keep going and hope your week stays free! First, congrats on finishing those Lily blocks and must have been a great feel of accomplishment there. They look really great and on to the next step! Really cute toaster and who wouldn't enjoy making toast with it. Glad your "Mothers Day" was nice....mine too! 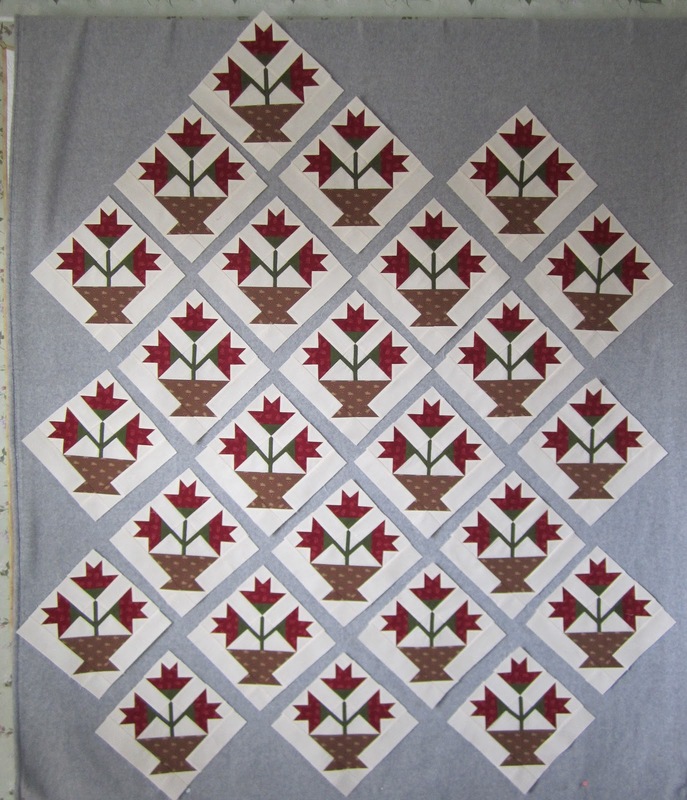 The Carolina Lily blocks are not the easiest to piece. You have done a very good job. What a gorgeous kitchen! And the toaster is the perfect counter decoration! The lilies are also gorgeous! Just love that red toaster ! What brand is it ? Like you I do not like things cluttering my kitchen counters. Congrats on completing your Carolina blocks They are AWESOME ! Beautiful blocks! And what an awesome toaster! Love your new RED toaster!!! It is so cute and your kitchen is wonderful with little splashes of Thelma red :) Beautiful Carolina blocks. You'll be done with this quilt in a snap. I think I might have to break my toaster so I can get a red one too! Your roses are so pretty... to bad you couldn't spend Mother's Day with your daughter. I know i have to wait a few weeks to see my oldest son. I hope you are getting your lily's all together today, they look beautiful too! I adore a red and white kitchen! Yours looks beautiful with that splash of red over there on the bench. I don't like appliances out either. Only kettle, coffee machine and toaster here too. Hope your week stays open! Your blocks are so beautiful and of course that red toaster is so cool! Love how neat and tidy your kitchen counters are! The blocks are wonderful - congrats on your progress! Hope the sashing goes well too. Great toaster and it does look good in the kitchen - love a touch of red. What a beautiful mix of roses! I've had trouble with internet isssues and will have to go back and read about your Paducah trip - but love your toaster,like you anything RED. I will make do with my old 2 slice white one though, and keep putting it back in the cupboard - everything else is out on the counters in this tiny open plan we have............. bleh, What can I say, I'd rather sew!! Good luck on those sashings, I know you will keep on it until it's the "look" you want. So far, they look super!! Beautiful! The quilt, the kitchen and the adorable red toaster. So sorry about Paula's husband. Where-oh-where did you find that red toaster? It's so darn cute! I would love to find a blue one....Love you blog!